A tiny disk sat on the tip of her middle finger. 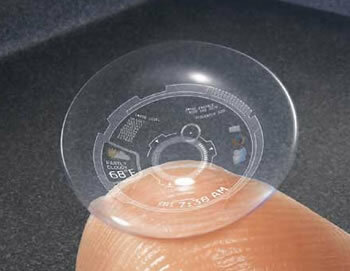 It was the size and shape of the contact lenses he had known. He hadn't expected more, but... he bent closed and looked. After a moment, he realized that it was not quite a clear lens. Speckles of colored brightness swirled and gathered in it. It turns out that somebody at Wired has come up with the same idea - and produced a cool graphic. Check it out. Take a look at the latest in science-fictional and real-life displays.